Lately I've been doing some modest couponing, but nothing too extravagant. I would check the Sunday paper (if we got it), as well as the Red Plum pamphlet that came during the week. If there was a coupon for something I would regularly purchase anyway, I would cut it out and save it in a drawer. After I started seeing savings, I started cutting out more coupons. I'm still limiting these to items I would actually use, but in terms of "more," I mean duplicates. I've started raiding my parents' newspapers, checking the local library's "free" bin on Sundays, and having my husband ask my father-in-law for the coupon inserts from his papers. Regular price: $20.29 My price: FREE!!!!!! 1.) Keep a price book! This way I know if a deal is really a deal, or if I can get the same item for less somewhere else (or make a substitution, use a generic, etc). 4.) Have fun--there is no need to stress about coupons! 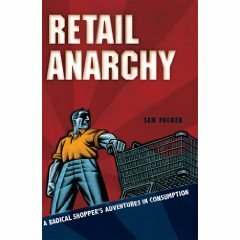 I believe that I was pushed over the couponing edge today due to reading the following book earlier in the week: Retail Anarchy by Sam Pocker. This book is filled with conspiracy theories, colorful language, opinions and tips--about coupons and retail in the United States. Despite the colorful language, I really enjoyed the points made and fun had. I do recommend this book as much for entertainment as for ideas about how to use coupons. Today I was that woman--the woman with one child crying and another eating a chocolate donut he was bribed with in the shopping cart. The woman who pulled out forty coupons. The woman who held up the line while a manager was paged to make sure everything was correct on the receipt. The woman who came back two hours later to challenge a discount not given on the receipt (and was rewarded $8 for it). The woman whose children grabbed shampoo off the shelf and squirted it all over the floor by the meat aisle (of course I apologized and cleaned it up). Even though I was that woman today, I am proud of myself for being assertive. This is something that is often difficult for me and I have to work hard to do. I was polite and courteous, and the sales associates were helpful in return. It worked out well. I know that I have an important role in my family as wife and mother, but I don't get the validation of a physical paycheck for my stay-at-home profession. Today I enjoyed the feeling of adding economically to my household instead of blindly spending the funds entrusted to me.